Departement of Vaucluse - Pop. : 2,400 h.
8km North East of Orange on the D976. 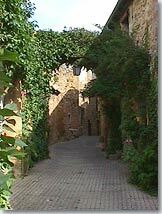 Serignan du Comtat is a small village surrounded by the famous vineyards of the "Cotes du Rho;ne" which extend as far as the forest hills of Uchaux. 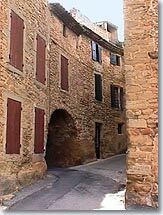 When you visit the village you can't fail to notice that most of the houses are built out of the local stone which produces a charming architectural harmony to the village. Take some of the smaller side roads which lead from the main street and you'll find some real architectural treasure such as the Italianate Baroque facade of Saint-Etienne's Church which dates back to the XVIIIe century. 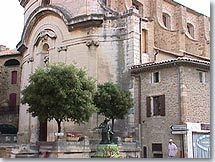 In front of the church is the bronze statue of Jean Henri Fabre (1823-1915), sitting with his walking stick in hand. The statue celebrates the fact that the famous entomologist lived in the village for a number of years. In 1879 Jean Henri Fabre decided to move permanently in to his country house called Harmas Harmas. He was a true walking encyclopedia, researcher, interested in everything and all scientific disciplines and left us with a wealth of his discoveries which can be found in his 11 volumes of entomological memoirs, numerous water colours and other writings. His house "l'Harmas" has become a national museum holding the treasures of this wise sage : drawings, books, herbs, minerals, insects, molluscs and fossils, not forgetting his botanical garden with more than 800 different species. Diane de Poitiers mistress of Francois 1er, lived in Sérignan until her death in 1565, in her father's chateau who was the local noble. Next to the Saint-Etienne church you can find the village clock set in a wrought iron campanile. At the top of the town hall square a small doorway takes you through to the workshop museum of the painter Werner-Lichtner-Aix.Only two arcades and the vaulted cellars of his medieval house remain but you can find a large collection of his works on display. In another style, a bit further on another artist has created her workshop on the main street.The potter Nadine Brancorsini, uses red clay which she models on her wheel and then decorates with rich bright colours. You can buy her works, choosing between beautiful salad bowls, water jugs and other pleasant items to decorate your table. 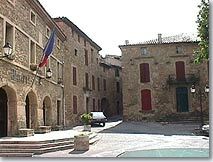 Harmas Museum and the works of Jean Henri Fabre. Saint-Etienne's church ( XVIII° C)..
Summer events. Arts and Crafts. 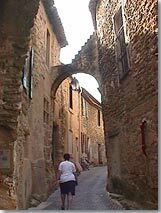 Mornas (10km), Uchaux (6km), Camaret sur Aigues (6km), Piolenc (5,5km), Sainte Cécile les Vignes (8km).